Rwanda was torn apart by genocide in 1994, with up to one million people being murdered in the African country within 100 days. With the 20th anniversary approaching, I travelled to the country's capital city Kigali to meet a group of cyclists who are helping the country move on from its sad and difficult past. I'm not sure what I was expecting but the first thing I noticed were the hills - perfect for cycling. 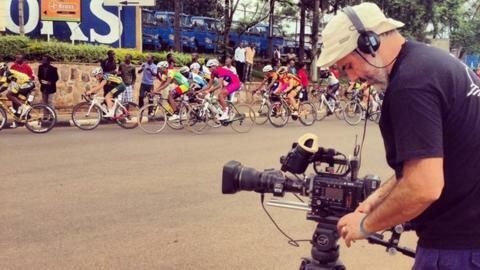 I was here to watch the Tour of Rwanda - an 800km journey around this beautiful country. The race began in 1989 but in the last few years it has grown from three teams to 16. It now attracts cyclists from around the world and is regarded as one of the best races in Africa. At its heart is Team Rwanda. Starting as a project to bring mountain bikes to the country in order to help farmers get coffee off the mountains, it has grown into a national racing team. Everywhere you look there are people on bikes in Rwanda and they're used for everything - from transporting people to moving huge parcels. But before 2007 they weren't used for racing. I sat down with the coaching team at the team hotel one night and time and time again the message came back loud and clear that cycling really can alter the course of a life here. It has clearly not been easy. There have been many problems a normal bike team wouldn't have encountered. Education was a real issue, the rider's diet had to be changed to enable them to cycle all day and many of the team have experienced trauma, having been young children during the genocide. But Team Rwanda is making a huge difference to these young men's lives. They've been able to buy houses with their race winnings; they can support their families. And it's not just the cyclists - they're helping train mechanics, coaches, trying to create something sustainable for the future. There's clearly a great deal of pride in the national team. The race is covered on the radio and estimates suggest that around half of the country's 10 million population would be listening to the Tour's progress round the country. As we followed it the numbers of people lining the streets to cheer their favourite riders on was unbelievable. It really was inspiring. The genocide still looms large in this country and it's not hard to find reminders of Rwanda's tragic past. One afternoon, we travelled to a memorial in Murambi, just 20km from the finish line of that day's stage. It was a strange place - an empty building on the top of a hill. A local guide told us it had been intended to be a school, but it had remained unfinished after one of the worst acts of the genocide happened there. Some 45,000 local Tutsis had fled to the school looking for sanctuary. Instead they were trapped on the hill, the water was turned off and one April night they were attacked. Only 13 people survived. Driving back to Kigali gave me some time to reflect on what I'd seen in Murambi. Being at a sporting event which is having such an impact and meeting these inspirational cyclists, I found it hard to keep my emotions in check. The message coming loud and clear from them was that they are proud of their country. They want to be united, they want to be Rwandans and see their flag flying and people wearing their shirt. More importantly they want to see a better image of their country. They've moved on and I think they want us to do the same. Team Rwanda didn't win the Tour this year, in fact they never have. There's clearly a long way for them to go before their cyclists get on podiums or are good enough to take part in classic races like the Tour de France. Their journey will start with the Commonwealth Games in Glasgow next year and maybe continue on to Rio in 2016. What's been achieved here, though, has never been seen anywhere before. From a cycling nation that came from zero to where they are now is quite simply remarkable. As my time in Rwanda drew to a close, I was struck by something Nelson Mandela once said: "Sport can create hope where once there was only despair." It's simplistic but you can see how this inspiring team embodies the progress that this remarkable country has made.